If you are shopping for a blue velvet tuxedo blazer that have that Frankie Valley and the Four Seasons look, this blue velvet tuxedo blazer by Ferrecci will have that Jersey Boy look you're seeking. 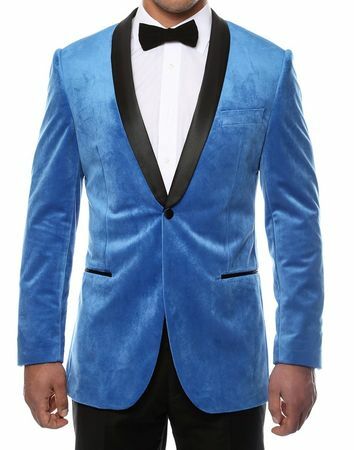 Featuring a shawl collar style with contrasting black collar and all made of soft touch velvet, you will look like you belong on the stage in this blue velvet tuxedo blazer. Comes with side vents in the back.